The top line above is the latest poll result in the New York City mayoral race. Public Advocate Bill de Blasio has skyrocketed to 43 percent in the latest mayoral race poll, an astonishing climb that puts him past the 40 percent threshold needed to avoid a runoff. 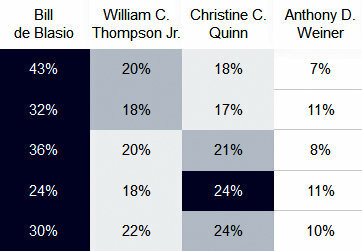 The poll of likely Democratic primary voters from Quinnipiac University released one week before the September 10 primary election finds former Controller Bill Thompson and City Council Speaker Christine Quinn locked in a brawl for second place with Thompson getting support from 20% of likely voters and Quinn just behind with 18%. The two are in a statistical dead heat in the poll of 750 likely Democratic primary voters that had a 3.6% margin of error. Former MTA head Joe Lhota, the leading GOP candidate, is not predicted to face a runoff either.